… and I should never, never forget that. Because nothing says “innocent” like doing the same thing again within a short amount of time. Even OJ waited years! Ug. Why am I so ugly about a person I don’t know? Why does this happen to so many people I know? We see things that make us upset (and I am upset if he really legitimately is waving his gun around at his family in light of what he’s been through), and we feel entitled to spout off about it. We have these feelings about the “event” and lump the person into it like he’s the mascot for out of control guns in America or something. I deleted the post. I’m really glad I did. 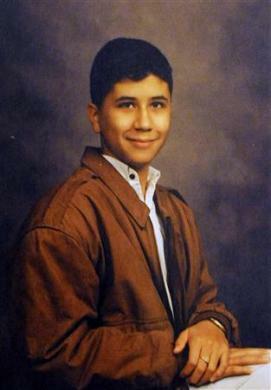 George Zimmerman is pictured in a school photo from 1998 in this handout photo obtained by Reuters April 25, 2012. Instead, I want to reflect on his humanity. This Reuters article helped me do that. It’s excellent. It gave me the most full picture of who Zimmerman is that I’ve never had. I wish I’d read it before or during or shortly after the trial. It reminds me that I could easily be George Zimmerman. The article doesn’t change the fact that Zimmerman got out of the car and pursued Martin when he was told explicitly not to. It doesn’t change the fact that he made choices that led to serious consequences for many, many people. But, this article reminds me that people need accountability in their lives so they don’t go off the deep end. It reminds me that well-meaning and passionate people can make bad decisions that lead to serious consequences. It reminds me that Zimmerman needs prayer just as much as Martin’s family does. This was written over a year ago, and it feels really important to read it now in light of his recent debacle. Read the Reuters article and think about his neighbors, his family, his friends, and lift them up in your heart, in your prayers. Recliner Quarterbacking these events just hurts everyone. I needed to remember that today. Great post. Very true. Reading the Reuters article now. Glad you have an open mind and heart; I am certainly on the giving end with the Zimmerman hate, but it’s important to remember that he’s still a person afterall.